Today was a bank holiday so me and the girlfriend did what all proper British people do on a bank holiday, head for the coast, Scarborough to be precise. I think the last time I went there was about 5 years ago to see Belle & Sebastian playing at the Futurist Theatre on the seafront. Whilst it was an excellent show it was a pain that it was so far away and annoying to get to. And I was driving so I couldn't even have a beer. Today, we took the train instead (though there was no fey pop to be had upon arrival). It's quickish and runs every hour from York. I figured that the A64 would likely be well busy, especially as the promised rain seemed absent. It's so much easier to get the train and avoid the queues and parking. All seaside towns are strange places. They always seem to be in need of a lick of paint. Scarborough seafront has a mixture of really old nice buildings and garishly coloured modern monstrosities (in need of the aforementioned lick of paint). It feels like if they only had some kind of proper town planning going on (perhaps 50 years ago) they could make something really nice. It was reasonably hard to find somewhere that looked half decent to have lunch in. In the end we went for one of those big chain bar things (Baracuda) where you know you won't have an awful meal but not a Michelin star either. We both had surf 'n' turf. Mine was rare and came medium, hers was well done and came very well done. As ever. But it tasted fine enough and was not too expensive. We found a much nicer looking (non-smoking) bar later in the afternoon, called Mist. 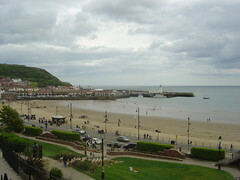 Looks like it could be worth checking out if you ever find yourself in Scarborough without a clue where to go.